How to make buses more accessible! Our blog this week looks at the work a bus company in the South of England have done to improve their accessibility. With the ageing population, and therefore more passengers possibly requiring extra assistance, it was decided that it was essential that we looked at more ways to help passengers by improving access for all​ ​therefore 18 months ago our managing director, Martin Harris, implemented my role to expand on ways that we could do this. Since the change I have actively worked this role and really love my job as I feel like I am accomplishing something and helping to improve the travelling experience for our passengers. We are quite limited in the space on board a bus and therefore its imperative that we ensure we utilise this space fully for the betterment of everyone travelling on board and not just a select few. Whether someone is walking on the bus to commute to work or boarding in their wheelchair to take their kids to school we need to make the journey smoother, more comfortable and much easier for everyone. Ensuring that drivers wait until someone unsteady ​on​ their feet is seated before pulling away can make all the difference. We are passionate about improving access for all and therefore have instigated new initiatives to this end. This has included the Helping Hand scheme, Taxi guarantee scheme and the introduction of allowing some scooters on our buses. Training has also vastly improved with practical training days with us working with organisations such as Guide Dogs for the Blind and Friends of the Elderly. These practical training sessions have proved to be very popular with staff and we have found that already its having a huge impact on the customer service being delivered. In partnership with Federation of Disabled People, Shopmobility and Weald Mobility we have been testing scooters on the buses to find which models can not only travel on board but are able to turn to board and alight. An accessibility officer has been made available to any passenger unsure whether their scooter is suitable for bus travel. The officer meets and advise​s​ as well as issuing a 'bus worthy' travel card once checked and passed for travel. Shopmobility provide people with scooters to use locally. They have just been donated 6 scooters that are able to board buses meaning that passengers can use them in the town as well as travelling on the bus and we have been really pleased to be part ​of something that will give many more people the freedom to use public transport and hope to expand the project further in the future. The Helping Hand scheme is a yellow card that has been designed to allow the passenger to discreetly inform the driver of any extra assistance that is required. We looked at other schemes in place and have tried to ensure that the card is simply laid out yet effective and therefore helpful for the passenger. 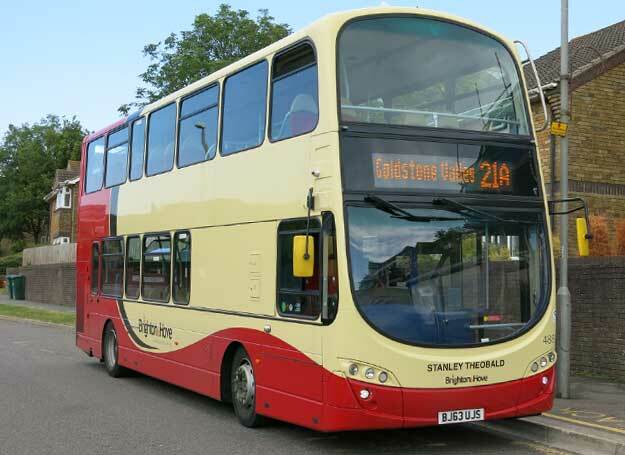 There is no company logo so that it can be used on other bus companies and not just on Brighton & Hove and Metrobus. Yellow to use as a hailing card as the bus approaches. The driver then instinctively knows the passenger may require extra assistance before reading the card. Black writing on a yellow backgrounds helps passengers to read the card easier. The message to the driver is on the front of the card. The back of the card holds the passengers name as well as an emergency contact number of their choosing. Messages such as 'Please assist if required' , 'Lower the step and wait until seated' or 'Face me I lip read' are just examples of the many cards we have in circulation. Passengers can request a card from a list on our website or can opt for a bespoke card to be made. We now have over 1500 cards in circulation and this is growing daily. Feedback has been positive from passengers and staff alike with many people informing us that this has really helped them. Many passengers have also passed on that they are using their cards off the bus also in local venues such as the cinema and in shops. The taxi guarantee scheme was implemented by our ​managing director​ to ensure that any passenger in a wheelchair would have access to travel at all times. With only 1 wheelchair space on board and other passengers 'sharing' this space we needed to ensure that a wheelchair user has priority whether this means travelling on the bus or us providing a free taxi. Across our network Taxi companies have been employed that can carry manual as well as electric wheelchairs. If for any reason a Wheelchair user cannot access their bus when arriving at the stop the driver will arrange, through the control room, a free taxi. This has really taken off and at the present time we are providing 3-4 taxis a month and are really pleased to be offering this service. We know that we still have a long way to go to ensure that our buses are fully accessible for everyone but feel confident that we are heading in the right direction. This has been made so much easier by the help and support of local groups and individual passengers providing feedback. Please contact me at victoria.garcia@buses.co.uk, if you require any further information on anything that we offer.